Miami has always been known for its warm weather, with summer like temperatures all year long. Norwegian Cruise Line is set to change that perception however, with its newest cruise ship, the Norwegian Getaway, set to sail from the Magic City this February. 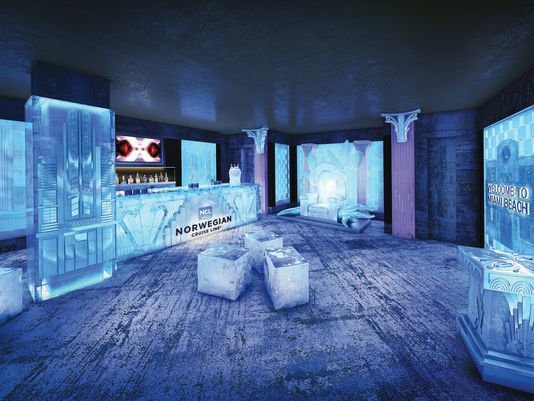 Like its sister, the Norwegian Breakaway, and fleet mate, Norwegian Epic, the Getaway will be outfitted with a bar that’s made entirely out of ice. The Getaway’s ice bar will be very similar to the rest of the ship. Not because of temperature, but because of style. With the Getaway being based out of Miami full time, the ship is going to be themed Miami, and much of the decor will be reminiscent of the distinctive South Florida style that the city has come to represent. In addition to the tropical touches throughout the ship, the hull art from David “Lebo” Le Batard, the ice bar will give you a South Beach feel, with sculptures featuring palm trees and the iconic Ocean Beach cityscape and the “Welcome to Miami Beach” sign. The ice bar will operate as a partnership with Svedka vodka and Inniskillin Ice Wine, offering unique Svedka and Inniskillin cocktail options for the parka clad visitors to the bar. Plenty of other features will help make the Getaway an excellent destination unto itself as well. Featured on this ship will be the Broadway hit, “Legally Blonde, the Musical,” as well new and exclusive Nickelodeon experiences for the kids, like the brand new “Name That Game” interactive kids feature. Also featured will be a new magic themed entertainment venue and the first grammy experience at sea. Some of the biggest hits from the Epic and Breakaway will make it aboard the Norwegian Getaway as well, like Geoffrey Zarkarians’ two restaurants “Ocean Blue” and “Raw Bar” as well as the return of the studio cabins, the 678 Ocean Place public spaces and the Spice H2O outdoor night club. We’re excited to see the Getaway go live this winter, and keep an eye out here for more updates as they come in! Start planning your Norwegian Getaway today! Click here to choose from all the different cruise options during this ship’s inaugural season!